Small in size but big in character, the proud nation of Estonia manages to pack historical cities, swathes of charming countryside, a picturesque coastline, and rugged islands into a relatively small amount of space. Thanks to its compactness, you can easily travel between the many tourist attractions the country has to offer for an exciting, diverse Estonia holiday. Although just a stone's throw away from Finland, Latvia, and Russia, Estonia boasts its own distinct culture, evident in the country's cuisine, music, and traditions. This vibrant nation emerged from over 40 years of Soviet rule to be one of the most economically successful of the European Union's eastern members and is leading the way in tech industries. Harju County: The most populated of Estonia's counties, Harju County has something for everyone--culture-rich cities, stunning natural scenery, rolling countryside, and awe-inspiring rugged coastline. Tartu County: Sandwiched between the country's two largest lakes, Tartu County offers some spectacular beaches and natural areas far less crowded than the coastline. The county is also home to a university town with a lively student buzz and historical center. Parnu County: Seaside Parnu County offers active travelers lots of Estonia vacation ideas, including fishing, hiking, biking, and kayaking. Ida-Viru County: History buffs will rejoice with a trip to Ida-Viru County, where you'll find a selection of historical buildings, the country's industrial heritage, and traces of Russian culture amid dramatic scenery. Saare County: The idyllic island setting of Saare County is rich in historical significance, tradition, greenery, and wildlife. The striking scenery and leisurely island pace make it a relaxing addition to your Estonia itinerary. Laane-Viru County: Brimming with authenticity, Laane-Viru County boasts plenty of charming villages for exploring, as well as a picturesque national park and expansive coastline. Tallinn: Seamlessly blending its medieval old town with sparkling modernity, Tallinn is home to a World Heritage Site situated against a bustling metropolis. Saaremaa: The largest of the Estonian islands, isolated Saaremaa preserves Estonian authenticity through its stone-fenced houses, thatched roofs, windmills, and home-brewed beer. Haapsalu: The major seaside resort town of Haapsalu is well-known for its historical and maritime ambience, warm sea water, curative mud baths, and friendly residents. Visitors partake in romantic walks, picnics, spas, and sailing. Otepaa: A small town set among the hills, Otepaa is the most sought-out city for winter sports, and in the summer hosts many outdoor concerts and music festivals. Viljandi: The parks and lakes of Viljandi play host to an annual folk music festival for which the city is best known. Tartu: A bustling modern metropolis and one of the oldest cities in the Baltic region, Tartu has a buzzing atmosphere and is a center for education. Parnu Parnu: Estonia's summer capital, Parnu, is a popular Estonia vacation spot with golden sandy beaches, parks, and plenty of water sports on offer. Tallinn Old Town: Topping many Estonia itineraries, this World Heritage Site preserves architecture dating back as far as the 11th century and features fortified walls, cobbled streets, winding alleys, and panoramic views of the city and gulf. Tallinn Town Hall: Bustling with street performers, quaint boutiques, curious travelers, and 15th-century Gothic architecture, Tallinn Town Hall is a focal point for the city and a lively city square. Toompea Hill: A haven for history and politics buffs, Toompea Hill has long been the seat of Estonia's parliament and the epicenter of Estonia's rulers throughout history. The hill also plays host to a 9th-century fortress, Russian Orthodox cathedral, and the church of St. Olaf. Alexander Nevsky Cathedral: This spectacular, colorful 20th-century cathedral is a testament to the country's perseverance, having survived demolition and the banning of religious practice under Soviet rule. The cathedral, named for a medieval Russian prince, gives a nod to the country's former tsarist rulers with its multiple onion-dome cupolas. Lennusadam Seaplane Harbour: Preserving Estonia's maritime history, this museum boasts an icebreaker ship, a World War II-era submarine, a seaplane, and the recovered wreck of a sailing ship. Kadriorg Park: Wander a network of paths and sidewalks through lush landscaping that leads visitors towards the royal palace and a handful of accompanying surrounding museums. KGB Museum: Go undercover on your Estonia holiday with a trip to KGB Museum, where you'll tour the hotel rooms once used by KGB operatives at the height of the Soviet Union's secret police force. Oleviste Church: This 12th-century church--the country's tallest medieval structure--stands watchfully over the city's old town, serving the community and offering tours for visitors. Kiek in de Kök Museum and Bastion Tunnels: The fascinating Kiek in de Kok and Bastion Passages Museum presents the series of military tunnels and cannon towers that served to protect the city of Tallinn starting in the 17th century. The museum documents their use and important contribution to the country's independence. Tallinn TV Tower: An important symbol of the country's recent advancements, Tallinn TV Tower provides insight into the area's past plus panoramic views of the surrounding city. Estonia attractions include a wealth of family-friendly options to keep young travelers engaged and entertained. AHHAA Science Centre makes an excellent option for families looking for hands-on fun filled with surprises and excitement. Another option is Tallinn Zoo, where kids of all ages can come face-to-face with rare species of animals and birds, enjoy a leisurely stroll with ice cream in hand, or even pet their newest friend. If your little ones need some diversion on your Estonia holiday, you'll find almost every village and town equipped with a playground and park. The long coastline provides ample opportunity for days at the beach during the summer months. There are also plenty of water parks, theme parks, and museums bound to keep youngsters entertained for hours on end. If you're traveling by car on your trip to Estonia it's important to note that all children are required to be securely fastened with a car seat or booster seat. If you're going by taxi, be sure to make a specific request when you call, informing them of how many kids are with you. In Tallinn, public transport is free for children up to seven years of age and passengers with children under three. Consider having your child wear a wrist-strap with your cell phone number(s) in case they get separated (alternatively, include the phone number and address of your accommodations). The cuisine of Estonia has many notes of its influential neighbours, with hints from Scandinavian, Russian, and German culinary traditions. Estonians take pride in producing their food locally, so you'll likely be treated to dishes sourced from nearby farms and fields on your tour of Estonia. Likewise, the dishes on offer complement the current season, using fresh ingredients. The local diet relies heavily on the country's bread production, with a specialty in crispy black rye bread. Other specialties include "verivorst," a black pudding, served with "mulgikapsad," a sauerkraut stew. Common dishes almost always have a Russian equivalent, and include plenty of game meat and smoked meat and fish. Every supermarket carries "kohuke," a flavoured milk-curd dessert coated with chocolate. If your sweet tooth still isn't satisfied, pop into a local bakery for traditionally made cakes and jams. With 3,800 km (2,361 mi) of coastline, it's not surprising that Estonia can dish up some delicious seafood. The many fishing villages and seaside towns are your best bet to sample these dishes. The summer capital of Parnu is sure not to disappoint in seafood offerings on your Estonia trip. Estonia's local design and handicraft have a long tradition of reliance on the country's natural resources. Local craftsmanship produces quality gifts and souvenirs for purchase in both larger shopping centers and smaller boutiques. Antique furniture, books, jewelry, alcohol, textile, and wooden items are among the most popular gifts and souvenirs. Estonian textile production focuses on natural fabrics, yielding a long tradition of knitting, crocheting, and embroidery. Popular items include traditional embroidered slippers, crocheted table cloths, and crocheted curtains. Consider including Haapsalu on your Estonia itinerary for a chance to browse the "miracle in lace" knitted scarves. The area of modern-day Estonia was first inhabited in 9000 BCE when ancestors settled along the Baltic coast. During the years of 800 CE and 1200 CE Vikings invaded the land, and from 1208 to 1227 the country was occupied by foreign powers including the Teutonic Orders, the Danes, and the Germans. During the 16th-century Livonian war Russia, Denmark, Norway, Lithuania, Poland, and Sweden all fought for control over Estonia. In 1561 control was awarded to Sweden, who later ceded power to the Russians in the 18th-century Great Northern War. In the 19th century the country underwent a great rise in national consciousness, which backlashed against all attempts to "Russify" Estonia. Following the 1905 revolution in Russia, Germany took occupation of Estonia in 1918. During the War of Independence in 1918, Estonian forces with the help of Great Britain successfully beat the German and Soviet armies. In 1920 Estonia was recognized as independent. Again, however, the USSR and Germany took turns occupying Estonia and executing mass deportations between 1940 and 1949. It was only in 1987 that open protests were held against the Soviet rule, followed by the 1988 declaration of sovereignty. In January of 1991 the Soviets reacted by cracking down on the Baltic States, but the August 1991 coup in Moscow was Estonia's saving grace--the collapse of Russian authority restored the nation's seemingly impossible dream of independence. Today, Estonia's long history of perseverance seems to have paid off, with the nation emerging as one of the most prosperous former Soviet states. 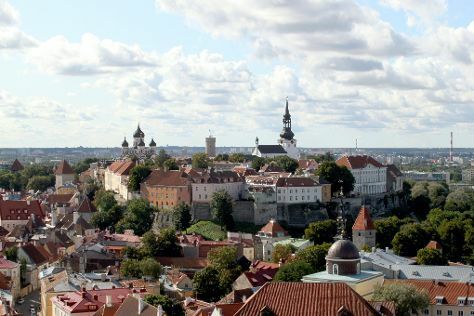 To get a better sense of the nation's struggles and achievements--and the people's enduring pride in their heritage--include historical attractions like Toompea Hill on your Estonia holiday. Estonians are generally reserved, often very socially introverted. Its not uncommon for Estonians to remain at a distance in both public and private spaces. People move quickly, avoid eye contact, and speak in hushed tones when in public. Estonians like to maintain that they are the opposite of Russians, whom they perceive as being loud, boisterous, and disrespectful of personal space. Estonia celebrates Independence Day on February 24 and May Day on May 1 (International Workers' Day, a holdover from the Soviet era). Summer solstice festivities held on June 24 include large bonfires; custom has it that patrons attempt to jump over the bonfire in some areas, while in others they set fire to old fishing boats. As the longest day of the year, it is the peak of the "white nights," with very few hours of darkness, and many Estonians have the tradition to stay awake until sunrise. Of particular mention are Estonia's Easter traditions, heavily influenced by its rich, varied historical background and periods of different rule. Along with the religious significance, the Easter traditions also celebrate the arrival of spring and warmer weather, met with spring fairs and painted eggs. Indulge in the traditional dessert of "pasha," cottage cheese with raisins, nuts, and berries. Sweet bread is also in high demand during the Easter festivities. If you're looking for Estonia vacation ideas and traveling during the Easter season, look no further than Eesti Vabaõhumuuseum / Estonian Open Air Museum, where visitors can enjoy the traditional farm food experience and try their hand at some of the many traditional Estonian crafts. Estonia's position on the coast of the Baltic Sea means that the country has a wet, maritime climate. The sea provides a consistent cool breeze that prevents temperatures from getting too hot in the spring and summer. In the spring and autumn months rain is quite common, so pack an umbrella and jacket. In the winter, the temperature falls below freezing, when snowfall creates pristine skiing conditions. If your Estonia trip occurs during the winter months, you may be able to drive across the ice roads that connect the islands. Because of Estonia's northern position you can enjoy up to 19 hours of daylight in summer, while winter days are brief. As a member of the European Union and of the Schengen Agreement, Estonia enjoys no border controls when traveling to and from other partnered countries, though spot customs checks do happen occasionally. Most visitors to Estonia arrive by plane at Estonia's international airport in Tallinn, and three other local airports service domestic flights. If traveling from Russia, you might opt to take the train instead as there's direct service between Moscow and the capital. Additional railway lines connect Tallinn to cities in the east, south, and west. Visitors can also opt to enter the country by bus or by boat. To get from place to place on your Estonia trip, your best bet is likely by bus, as the railway does not cover the entire country and has suffered considerably following privatization. Visitors can also opt to journey by bike or car, or to hitchhike. The official language of Estonia is Estonian, which is linguistically a close cousin to Finnish. On your Estonian holiday you'll find English widely spoken in urban areas. Over half the population is reported as speaking Russian as a second language, and 45 percent of Tallinn's population speak it as their native tongue. Finnish and German are also prevalently spoken. Tipping in Estonia is entirely voluntary, but it is considered polite to tip 10 percent of the bill as a sign of satisfaction for the service. Patrons may tip more if they feel the service was exceptional.